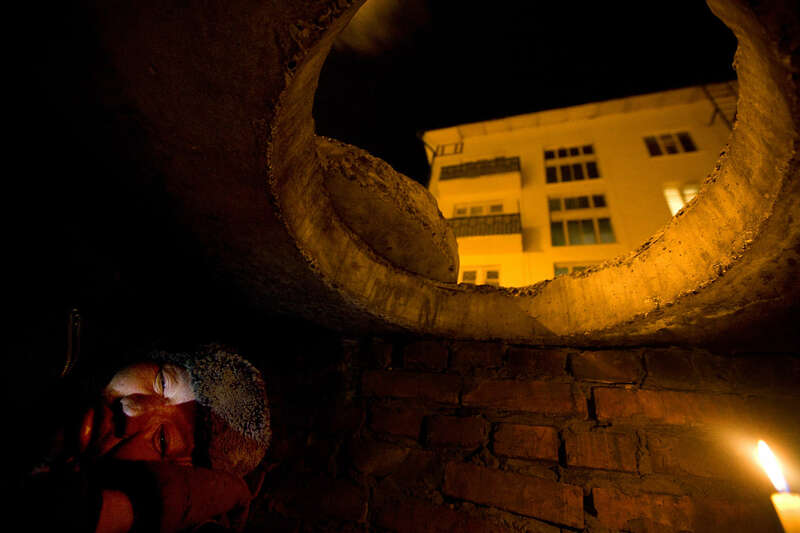 A homeless drunk rests in the sewer where he lives after drinking vodka March 16, 2010 in Ulaan Baatar, Mongolia. Since 70 years of communist rule ended in 1990, Mongolia has become one of the most pro-business countries. While economic reforms have brought prosperity to Ulaan Baatar, there still widespread unemployment, some used to work in the now defunct state industries. Approximately over 35% of Mongolians live below the poverty line, many unable to buy basic food needed to survive. Social problems include depression, alcohol abuse, domestic violence and crime. Mongolia suffers with a very high number of alcoholics, all consuming cheap Mongolian vodka that is readily available to the poor and the unemployed, Many Mongolians have immigrated to the capitol city from the far away provinces seeking employment. For the homeless during the winter this means extreme hardship, for some homeless living in the sewers means warmth verses dealing with temperatures dropping as low as -25C mid- Winter. This year Mongolia has experienced the worst winter in 30 years.